Sycamore City Hall is located at 308 West State Street, Sycamore, IL 60178; phone: 815-895-4515. Photo: William W. Marsh House, ca. 1873, 740 West State Street, Sycamore, IL. Listed on the National Register of Historic Places in 1978. Photographed by User:A. McMurray (own work), 2007, [cc-by-3.0 (creativecommons.org/licenses/by/3.0)], via Wikimedia Commons, accessed July, 2014. The City of Sycamore is the county seat of DeKalb County and is located in north central Illinois, approximately 58 miles west of the City of Chicago and 30 miles southeast of the City of Rockford. The City encompasses an area of 9.74 square miles and is served by Illinois Routes 23 and 64 which provide easy access to Interstates 88, 39, and 90. Other state highways in close proximity include Illinois Routes 38 and 72. Sycamore has its origins in a claim established on the north bank of the East Branch of the Kishwaukee River, then called the Sycamore River, in 1835. 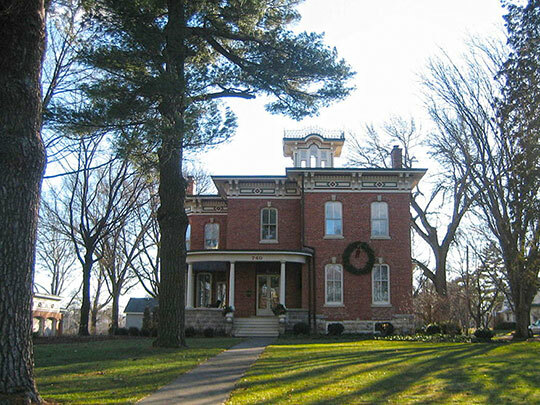 The present location was surveyed as a village plat in 1836 and a county seat controversy was settled in Sycamore's favor in 1839. That same year, Sycamore's broad streets were laid out by Eli Barnes and James Waterman. The surrounding prairie soils were particularly suitable for the raising of corn and by 1850 the population of 390 looked to the expanding rail network around Chicago as a vital link between local agriculture and a wider regional marketplace. In 1852, community leaders attempted to raise local subscriptions to build a rail line connecting Sycamore with the growing east-west rail traffic. This attempt failed and it was not until 1859 that Sycamore was linked with the prominent Galena and Chicago Railroad at Cortland for a cost of about $75,000. In 1858 Sycamore was incorporated as a village and in 1869 the community was organized as a city. The Civil War that divided and ultimately transformed the country in the 1860's had a salutary effect on the town's growth. By the early 1880's Sycamore had developed a substantial industrial base including the Marsh Harvester Manufacturing Company, the Reuben Ellwood Manufacturing Company, and the Sycamore Preserve Works. Though not extensive, this manufacturing presence helped push the City's population to 3,300 in 1900. City of Sycamore, Illinois, 2014 Comprehensive Plan Update, 2014, www.cityofsycamore.com, accessed July, 2014.